Who doesn't enjoy the soothing flavors of maple syrup and orange juice in the morning. Now you can try these great flavors together in the evening along with the great flavors of a beautiful pork chop. You will enjoy this! Preheat your grill to a medium-high temperature. In a small bowl, combine thoroughly the chili powder, salt, black pepper and cinnamon. Season this mixture on all sides of you pork chops and allow to set for 30 minutes while you are getting the grill going. While the flames are about ready, mix your maple syrup and orange juice in a small bowl...you'll need this later at the end of the cooking process. If you add it at the beginning, the sugars in the syrup will simply burn over the direct heat. Place on grill and cook until the center is longer pink - to about 150°. 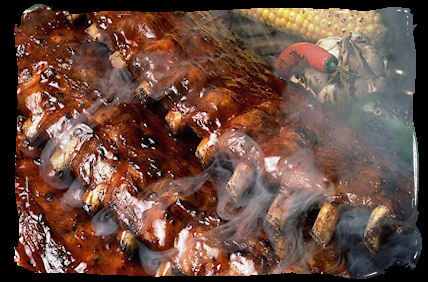 Then move to a cooler part of the grill and coat your chops with the sauce you've just made. Allow this to sit for about 5 minutes and serve while hot.